One more person has been killed in wild jumbo attack at Nagrijuli area of Baksa district along the Indo-Bhutan border on Tuesday. With the death of the person on Tuesday, two persons have died in wild elephants’ attack in Nagrijuli area. According to information, on Tuesday morning at about 5.30, a wild elephant, which has been named as ‘Laden’ by the locals attacked one person and killed him on the spot. The deceased has been identified as 55-year-old Sambhu Boro, a resident of of Kumbhijhar Janmoni Chowk under Nagrijuli Police Outpost in Baksa district. According to the locals while Sambhu Boro was working in the crop field in the premises of his house, the wild elephant suddenly appeared in front of him and attacked him in which he died on the spot. Local immediately informed it to Nagrijuli Police Outpost about the incident. Getting the information, Nilhil Singha, in-charge of Nagrijuli Police Outpost rushed to the spot and recovered the body of Sambhu and sent the body for autopsy. It may be mentioned that the same wild elephant earlier killed one Raghu Munda alias Ajay at the Nagrijuli Tea Estate on Monday at about 12.30 PM. Within 24 hours, the wild elephant has killed two persons at Nagrijuli. 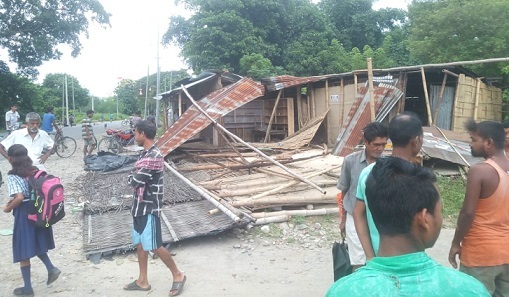 The wild elephant also destroyed four shops and a house at Bhaoraguri (Gogon Chowk) village and had eaten all the materials stored inside the shops and houses. The villagers have demanded that the authorities concerned should take necessary measures to provide security to the common people and their property. Otherwise, they have threatened to come to the street in protest against the Forest Department.